The Arlington Sun Gazette reported last Friday that "(y)ear-over-year sales rose and the average sales price of single-family homes that sold across Arlington topped the million-dollar mark in June, according to new data, even as the market continues to struggle with a dearth of inventory." "The 357 properties that went to closing last month represented an increase of 5.6 percent from the 338 a year before, according to figures reported July 11 by RealEstate Business Intelligence, an arm of the local multiple-listing service. "The overall average sales price of $687,652 was up about a half-percent, but only the single-family market ($1,007,044, up 2.7 percent) posted an increase. The average price of attached homes, such as townhouses and rowhouses, was down 4.6 percent to $434,065, while the average price of condominiums was down 5.2 percent to $386,769. "Add up the sales and prices, and total sales volume for the month stood at $245.5 million in Arlington, an increase of 6.2 percent from June 2016. "Homes that went to closing during the month had spent an average of 31 days on the market, a brisker pace than the 37 days required a year before, and garnered 98.3 percent of original listing price, down a tick from 98.4 percent. "A total of 61 properties changed hands for more than $1 million." In conclusion, the newspaper wondered "where is the marked headed,"Both pending sales and new pending sales were up during the month, as were homes coming under contract, suggesting continued strength as the market makes it transition from summer to autumn." We realize the numbers represent only one month of sales. June 30 also represents the cutoff date for computing the 2018 real estate assessments. Given the June increases, however, it's likely the County Manager and County Board are already contemplating the vanity projects that can be brought online. Source: page 83, "As Certain as Death: Quotations About Taxes," 2010, compiled by Jeffrey L. Yablon, TaxAnalysts.com (this is a new link for the collection, but publisher's identify shown on the first of the unnumbered pages; the link I had been using produced a 'page not found' message). George Gordon Liddy (born 1930) "is a retired lawyer who is best known as the chief operative in the White House Plumbers unit that existed from July to September 1971, during Richard Nixon's presidency. He was convicted of conspiracy, burglary, and illegal wiretapping for his role in the Watergate scandal," reports Wikipedia. CNS News editor-in-chief Terry Jeffrey wrote on Thursday, "Real monthly federal spending topped $400 billion for the first time in June, when the Treasury spent a record $428,894,000,000, according to the Monthly Treasury Statement released today." "Prior to June, the record for federal spending in a single month was held by March 2017, when the Treasury spent approximately $392,816,000,000. "In August 2012, the Treasury spent $392,408,410,000 in constant 2017 dollars. "As the Treasury was spending a record $428,894,000,000 in June it was taking in approximately $338,660,000,000 in taxes—thus, running a deficit for the month of $90,233,000,000. "So far in fiscal 2017 (which began on Oct. 1, 2016 and will end on Sept. 30, 2017), the Treasury has brought in $2,507,820,000,000 in taxes and spent $3,030,903,000,000—running a deficit of $523,082,000,000. "Last year in June, the federal government spent $323,320,000,000—or $328,303,590,000 in constant 2017 dollars. The record $428,894,000,000 that the federal government spent this June is $100,590,410,000 more (in constant 2017 dollars) than last June’s spending. "The dramatic increase in spending from last June to this June was driven by increases in spending by the Departments of Education, Housing and Urban Development and Health and Human Services. It was also helped by the fact that the first day of July fell on a Saturday rather than a business day." “Outlays for the Departments of Education and Housing and Urban Development increased by $33 billion and $21 billion respectively, because of upward revisions to the estimated net subsidy costs of loans and loan guarantees issued in prior years,” said CBO. CBO also noted the impact of July beginning on a Saturday. “Because July 1 fell on a weekend this year, certain payments scheduled for that date were instead made in June,” said CBO. 'If not for that shift, the deficit in June 2017 would have been about $44 billion lower.'" Based on spending and revenues of the first nine months of FY 2017, the federal government is headed towards annual revenues of $3.336 trillion and spending of $4.056 trillion in FY 2017, and a deficit of $720 billion. And ask for a written response. And tell them ACTA sent you. Ali Meyers reports for the Washington Free Beacon today, "The Old-Age and Survivors Insurance and Disability Insurance Trust Funds will be depleted in the next 17 years, according to the Social Security Administration's trustees report." (with link to Social Security Administration (SSA) 7/13/17 press release) According to the article, the program will begin to exceed revenues in 2022. She adds, "By 2034 the combined asset reserves of both funds are expected to be insolvent. Alone, the Disability Insurance Trust Fund will be insolvent by 2028." "It is time for the public to engage in the important national conversation about how to keep Social Security strong," said Nancy A. Berryhill, acting commissioner of Social Security. "People understand the value of their earned Social Security benefits and the importance of keeping the program secure for the future." "In 2016, the program took in $957 billion in income but still had expenditures as high as $922 billion. "The Committee for a Responsible Federal Budget suggests policymakers phase in gradual changes that would allow for more time to plan but also promote long-term economic growth. "The Social Security Trustees continue to underscore the need to address Social Security’s financing shortfall soon," the committee said. "Failure to act would result in all beneficiaries receiving a 23 percent across-the-board benefit cut when the combined trust fund exhausts in just 17 years, when today's 50-year-olds reach the normal retirement age. The SSDI program faces an even more immediate deadline and will deplete its trust fund in 2028." "Policymakers can still address Social Security's financial problem without making drastic tax or benefit changes, but the window for responsible action is closing," the committee said. "If policymakers are willing to act soon, they can create a plan that strengthens the program’s finances while phasing in changes gradually to give workers time to plan, improving retirement security for vulnerable beneficiaries and promoting long-term economic growth." "While some argue that taxes should be raised to save Social Security, David Barnes, director of policy engagement for Generation Opportunity, argues that it needs to be reformed instead. "Some claim that the solution to preserving Social Security is to raise more taxes, but history shows that doesn't work," said Barnes. "In fact, since Social Security was created, payroll taxes have been raised more than 20 times. Twenty times! Yet, the program is still headed towards insolvency." "Fixing Social Security isn't about throwing more money at the problem—it's about structurally reforming the program so it works better for current retirees and is still around for my generation when we reach retirement age," he said. "Otherwise, without serious change, young people must be given the choice to opt-out." Total expenditures from the combined OASDI Trust Funds amounted to $922 billion in 2016. Social Security paid benefits of $911 billion in calendar year 2016. There were about 61 million beneficiaries at the end of the calendar year. The projected actuarial deficit over the 75-year long-range period is 2.83 percent of taxable payroll – 0.17 percentage point larger than in last year’s report. During 2016, an estimated 171 million people had earnings covered by Social Security and paid payroll taxes. The cost of $6.2 billion to administer the Social Security program in 2016 was a very low 0.7 percent of total expenditures. The combined Trust Fund asset reserves earned interest at an effective annual rate of 3.2 percent in 2016. The complete Trustees Report is available here. The report includes literally an endless list of tables and figures. A detailed, 8-page analysis of the 2017 Social Security Trustees Report by the Committee for a Responsible Federal Budget (CRFB) is here. The Committee's first point will likely get your attention since it says "Social Security is heading towards insolvency" with the second point being that "Social Security's Deficits are large and growing." If that doesn't cause sleepless nights, nothing will. For the record, the CRFB is a bipartisan a policy organization as one can hope to find in Washington, D.C. For more information about CRFB, click here. This year’s reports from the trustees of Social Security and Medicare highlight the need for substantial reforms to both programs that can put them on sustainable paths while protecting other government priorities in the coming years, according to The Concord Coalition. “Once again, the trustees have made clear that without any changes, Social Security and Medicare will continue to claim ever-larger parts of the federal budget as other important federal programs are squeezed down to historic lows,” said Concord Coalition Executive Director Robert L. Bixby." "Today, the Social Security Trustees warned that the program faces major financial challenges, which threaten its sustainability and ability to provide essential benefits to millions of Americans. "According to the Trustees’ annual report, Social Security’s finances are facing growing pressure due to the aging of the population. As the large baby boom generation enters retirement and Americans continue to enjoy longer lifespans, more and more individuals will collect benefits from the system and for longer periods, while relatively fewer workers will contribute taxes to support it. "Social Security’s financial imbalance is the result of simple math. Since 2010, the Social Security program has been spending more than it has been taking in, and the Trustam’s trust funds will be exhausted in just 17 years, which will put millions of beneficiaries at risk of large benefit cuts." That one chart pretty-well explains why Social Security is becoming insolvent, not to mention things like the "$550 million worth of bogus applications for Social Security disability," which the government says were filed by Eric Conn. According to the Washington Times' Stephen Dinan today, "Conn paid off a team of doctors to write fake medical evaluations, and paid a Social Security administrative law judge to rubber stamp the bogus applications." Although I can't say that I've read or watched every news report about the Republicans bills to replace ObamaCare, it seems strange that the nation is embarking on a very large medical welfare/entitlement program, i.e., the repeal/replacement of ObamaCare, with no one talking about the looming insolvency of Social Security while at the same time another large social welfare program is "heading toward insolvency." As the hosts on RedEyeRadio.com like to say, "We're doomed." "Moral hazard exists when a policy produces incentives for perverse behavior , , , [For example] the policy of removing tens of millions of voters from the income tax roles, thereby making government largess a free good for them." Source: page 131, "As Certain as Death: Quotations About Taxes," 2010, compiled by Jeffrey L. Yablon, TaxAnalysts.com (this is a new link for the collection, but publisher's identify shown on the first of the unnumbered pages; the link I had been using produced a 'page not found' message). A news item yesterday in the online Arlington Sun Gazette said the Arlington County Board is "set to approve school expansion. "On Saturday, County Board members are slated to take action that will allow the School Board to expand the capacity of a high school and two middle schools (including Gunston, which reopened in the 1990s), while also providing for additional classroom-trailers at a slew of elementary schools. "The action comes as school officials continue to grapple with rising enrollment, which has seen the student population rise from less than 20,000 a decade ago to almost 27,000 today. "In a series of what are likely to be pro-forma actions, County Board members are slated to approve modifications that will increase interior capacity of Wakefield High School from 1,903 to 2,203 seats; increase capacity at Kenmore Middle from 986 to 1,060; and increase Gunston’s interior capacity from 932 to 1,004. "All are in line with requests from the school system. "In addition, County Board members are slated to act on requests to add temporary classrooms adjacent to Long Branch, Claremont, Oakridge and Patrick Henry elementary schools and Arlington Traditional School." The items are on the County Board's so-called consent agenda as Arlington Public Schools Use Permits (Agenda Items 8.A through 8.I.) The summary, background, and discussion on each of the nine reports to the County Board provide an interesting history of the Arlington Public Schools over recent years. Arlington citizens wishing to speak at County Board meetings can find additional information about meeting times here. As the Sun Gazette pointed out, "Thirty-nine years ago, Arlington school officials shuttered Gunston Middle School due to declining enrollment across the school district." Scroll forward from 1978. How times have changed. The Arlington Sun Gazette's Scott McCaffrey reported yesterday, "Arlington County Board members this week are expected to formally affirm the government’s desire to acquire Virginia Hospital Center’s South Carlin Springs campus as part of a land-swap agreement that would see a county-government-owned parcel delivered to the hospital." "Under terms of an agreement inked earlier, board members have until mid-August to formally notify hospital officials of the county’s desire to take the 11.6-acre Carlin Springs parcel, currently home to an urgent-care center and the Arlington Pediatric Center. "The land swap would only go through if Virginia Hospital Center officials opt to acquire a county-owned parcel in the 1800 block of North Edison Street immediately north of the hospital’s North George Mason Drive campus. But that is all but a certainty, as the hospital’s leadership long has sought a way to expand its land-locked holdings. "The Edison Street site most recently was valued at $12.6 million; in compensation for delivering it to the hospital, the county government can opt to receive land, cash or a combination, all to be worked out after hospital officials formally notify the county government of their desire for the Edison Street property. The hospital in June received approval from state regulators to expand onto the Edison site, another procedural hurdle needed before the swap could be consummated." He also wrote that both the county and the Arlington Public Schools have had their eye on his "rare large parcel of land." The 6-page staff report, dated July 7, 2017, of the "Notice of County Board election to require conveyance of the property" supports Item #54 on the Arlington County Board's Recessed July 18, 2017 Agenda. The county has a fully-informed webpage for the Virginia Hospital Center (VHC) Proposed Expansion, which includes updates, options, land parcels involved, and the related documents. We growled about the proposed land swap with Virginia Hospital Center on August 5, 2015 and September 11, 2015. A staff report in the Arlington Sun Gazette last Wednesday said, "Arlington officials and a Fairfax County landowner are giving themselves a little more time to work out the details for the county’s purchase of land in Springfield to use for maintenance of Arlington Transit (ART) buses." "County Board members in late June approved amendments to the purchase agreement, which extends the time limit for the Arlington government to complete its due diligence in evaluating the site, and also extends the time frame to garner Fairfax County government approval for land-use changes that will be required before the parcel can be used for its intended purpose. "Arlington officials late last year announced plans to buy the 2.2-acre site on Electronic Drive for $4.65 million. County officials already have tendered a check for $100,000, which will become non-refundable once the due-diligence period is over. "Under amendments agreed to by both the county government and property owner, the due-diligence deadline was shifted from June 19 to Sept. 29, while the deadline for the county government to file applications for land-use amendments with the Fairfax County government was extended from Sept. 19 to Dec. 30. "Under the agreement, Arlington officials hope to have Fairfax County zoning approval in hand by next July." The Arlington County Board "approved a contract to purchase a $4.65 million site, zoned for industrial use, at 6701-6705 Electronic Drive in Springfield to be used for construction and operation of a heavy maintenance facility for the County’s growing Arlington Transit (ART) bus fleet" on December 14, 2016, according to a county press release. In addition to the price to be paid, the press release highlighted the "new facility would accommodate ART bus fleet growth" and "will bring certainty to ART operations." "Until this ART bus facility is completed, the majority of buses will move to the newly leased 2631 Shirlington Road site, while the balance will be temporarily housed at the Water Pollution Control Plant. "Once completed, the new ART facility and the Shirlington site will accommodate all of the ART bus fleet. However, the Shirlington site is not a long-term solution, since the County's lease expires in 2023. A long-term solution will be examined as part of the Joint Facilities Advisory Committee." "The total budget for the ART bus facility and streetscape improvements is $17.6 million, which includes design, construction, construction management and related costs. Funding comes from a combination of state and regional funds and local commercial real estate tax revenues that may only be used for transportation." "The Arlington County Board today approved a $12.4 million contract with W.M. Schlosser Company, Inc. to build a new Arlington Transit (ART) bus facility in Crystal City, at South Eads and 32nd Streets. The facility, long included in the County’s Capital Improvement Plan, will provide crucial operational space for the County’s growing ART fleet, which has nearly 60 buses today and plans to grow to 90 by 2022." "The County will pay $720,000 in rent the first year, and another $460,000 to prepare the site, for a total first-year cost of $1.1 million. Construction costs will be funded through a combination of state and regional transit grants and funds." The press release's first bullets said "supports growing ART bus fleet." In his Right Note column for ARLnow.com on Thursday, July 6, Mark Kelly tries to make senses of the continual need to find space for its ever-growing ART bus fleet, urging the county panjandrums to "Stop 'Saving' Us Money." "After spending over $17 million for the yet-to-be-opened ART bus light maintenance facility in South Arlington, the county announced it is close to acquiring land for a third ART bus facility in Springfield. "The land cost for the heavy maintenance facility in Springfield itself is reported to be $4.65 million before up to $32 million could be added in the design and build process. "County officials admitted when the first facility was announced that it was too small to meet actual maintenance and storage needs, but that did not stop them from moving forward with it. The maintenance facilities are on top of the acquisition of land for ART bus parking in Shirlington. "As noted at the time, the South Arlington facility would save tax taxpayers $57,000 a year that Arlington pays to use existing Metrobus maintenance facilities. At that rate, the facility will pay for itself in about 308 years. If Arlington taxpayers are lucky, the heavy maintenance facility will pay for itself in 100 years or less. "Sure, Metro could stop allowing us to use their facilities, though it is hard to imagine they are looking to shed any extra revenue sources right now. Yes, it’s nice to have a facility that is our own. But spending millions on a “nice to have” project is the type of decision that can eventually get governments into financial hot water. "To put this in business terms, the decision to move forward with these maintenance facilities represents a negative return on investment. Only in government would you justify them as saving taxpayers money." We've growled at least three times about Arlington County's ART buses -- April 30, 2015, August 31, 2016, and December 14, 2016. On April 26, 2017, the county issued a press release after receiving a national planning achievement award for smart growth from the American Planning Association. Based upon the narrative above, it certainly doesn't appear those planning skills don't extend to Arlington County's ART bus program. Source: Founders Quote Database, The Patriot Post. The lede yesterday, in CNS News' Susan Jones report, said, "The U.S. economy added 220,000 jobs in June, the best showing since February and well above analysts' expectations of 174,000." She then added, "The Labor Department's Bureau of Labor Statistics also said the number of employed Americans -- which set records in February, March and April -- set another record in June, at 153,168,000 employed." "And the number of Americans not in the labor force -- after four straight monthly gains – dropped a bit to 94,813,000. "People age 16 and older who are not institutionalized or in the military are counted as “not in the labor force” if they are neither working nor looking for work. This number includes retirees, students, homemakers, the disabled, and others who have stopped looking for work for whatever reason. "The labor force participation rate rose a tenth of a point to 62.8 percent in June, which is within two-tenths of a point where it's been since January. As BLS has noted, the participation rate shows no clear trend. "The June unemployment rate increased a tenth of a point to 4.4 percent, which is near historic lows. "Really great numbers on jobs & the economy! Trump tweeted on July 3. "Things are starting to kick in now, and we have just begun! Don't like steel & aluminum dumping!" "He was talking about a July 3 report showing that U.S. manufacturers grew at their fastest pace in three years. In Friday’s report, BLS said the economy added 1,000 manufacturing jobs last month, for a total of 12,396,000. "In June, the nation’s civilian noninstitutionalized population, consisting of all people age 16 or older who were not in the military or an institution, reached 254,957,000. Of those, 160,145,000 participated in the labor force by either holding a job or actively seeking one. "The 160,145,000 who participated in the labor force equaled 62.8 percent of the 254,957,000 civilian noninstitutionalized population." She also reports on revisions and the recent update to the CBO budget and economic outlook report. Here's another link to her entire report. Separately, Terry Jeffrey noted, "The growth in the number of employees in federal, state and local government jobs beat the growth in the number of employees in manufacturing jobs 35 to 1 in June . . . The seasonally adjusted government employment number grew by 35,000 in the month, while seasonally adjusted manufacturing employment grew by only 1,000." Also, so far in 2017, he added, "the United States has created 1,000 more government jobs than manufacturing jobs, according to the BLS data." You can read the June jobs report -- technically the Employment Situation Summary -- published by the U.S. Department of Labor's Bureau of Labor Statistics here. To learn more about CNS News, click here. UPDATE (7/9/17). At Washington Free Beacon on Friday, Ali Meyer reported on the June jobs report. "While on the face, these numbers are decent, the White House celebration should be short-lived, and more attention must be placed on passing meaningful reforms through Congress. Growth cannot be sustained if we continue down the same path we are on." "The U.S. job market roared back to life in June, with a better-than-expected 222,000 new positions created in June while the unemployment rate held at 4.4 percent, according to a government report Friday. "Economists surveyed by Reuters had been expecting nonfarm payrolls growth of 179,000 and the unemployment rate to be 4.3 percent. "Wage growth, however, remained muted, with average hourly earnings rising 2.5 percent on an annualized basis, essentially unchanged from the previous month. On a monthly basis, the rise was 0.2 percent, which actually was a shade below the 0.2 percent expectation. The average work week edged higher, rising 0.1 hours to 34.5. "The report "is another illustration that the real economy is in good health," said Paul Ashworth, chief U.S. economist at Capital Economics. 'The only disappointment is that wage growth still shows few signs of accelerating.'" "The first 9 pages of the Internal Revenue Code define income; the remaining 1,100 pages spin the web of exceptions and preferences." Source: page 63, "As Certain as Death: Quotations About Taxes," 2010, compiled by Jeffrey L. Yablon, TaxAnalysts.com (this is a new link for the collection, but publisher's identify shown on the first of the unnumbered pages; the link I had been using produced a 'page not found' message). Warren G. Magnuson (April 12, 1905 – May 20, 1989), lawyer and Democratic politician. He served in both the House of Representatives (1937–1944) and the U.S. Senate (1944–1981) from Washington. " according to WikiPedia. At CNS News this afternoon, Terry Jeffrey began his report on the Congressional Budget Office's recent "Update to the Budget and Economic Outlook 2017 to 2027 writing, "Both the Congressional Budget Office and the White House Office of Management and Budget project that federal spending will top $4 trillion for the first time in fiscal 2017, which began on Oct. 1, 2016 and will end on Sept. 30." "In its “Update to the Budget and Economic Outlook: 2017 to 2027 ” published last week, CBO projected that total federal spending in fiscal 2017 will hit $4,008,000,000,000. "That is up from the approximately $3,853,000,000,000 that CBO and OMB say the federal government spent in fiscal 2016. "In President Donald Trump’s fiscal 2018 budget proposal, the OMB estimates  that federal spending in fiscal 2017 will hit $4,062,000,000,000. "The $4,008,000,000,000 the CBO estimates the federal government will spend this fiscal year equals $33,805 for each of the 118,562,000 households the Census Bureau estimated were in the United States as of March." He included the following chart with his report. The CBO "Update" is available here. 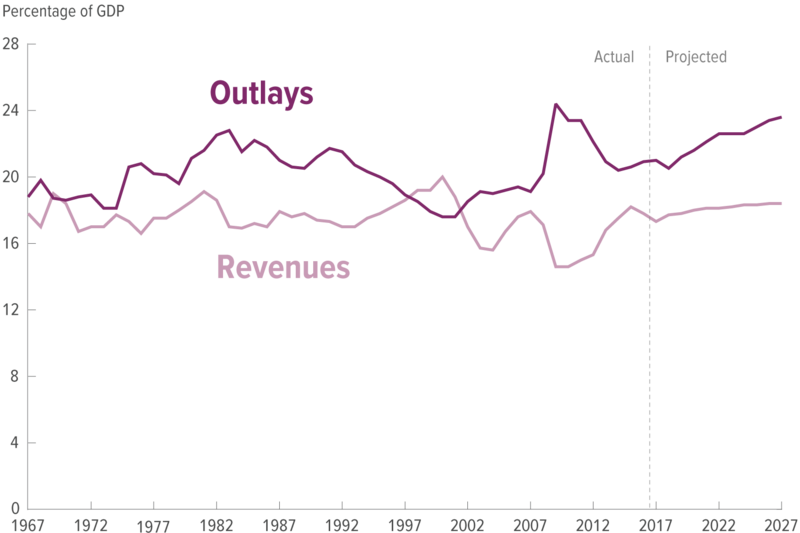 The following chart is from the CBO report, and shows how expenditures and revenues have fluctuated since 1967, including the very short period around 2000 when the federal government ran a budget surplus. Take a minute and scroll back to the last paragraph of Jeffrey's report. Note that the $4 trillion budget "equals $33,805 for each of the 118,562,000 households the Census Bureau estimated were in the United States as of March." Think about that number for a minute, and ask yourself just how sustainable the federal budget is on its current trajectory. A study published today by the Tax Foundation (Fiscal Fact No. 553) discusses state and local sales tax rates at mid-year 2017. "Retail sales taxes are one of the more transparent ways to collect tax revenue. While graduated income tax rates and brackets are complex and confusing to many taxpayers, sales taxes are easier to understand; consumers can see their tax burden printed directly on their receipts. "In addition to state-level sales taxes, consumers also face local sales taxes in thirty-eight states. These rates can be substantial, so a state with a moderate statewide sales tax rate could actually have a very high combined state and local rate compared to other states. This report provides a population-weighted average of local sales taxes as of July 1, 2017, in an attempt to give a sense of the average local rate for each state. Table 1 provides a full state-by-state listing of state and local sales tax rates." Local sales taxes are collected in thirty-eight states. 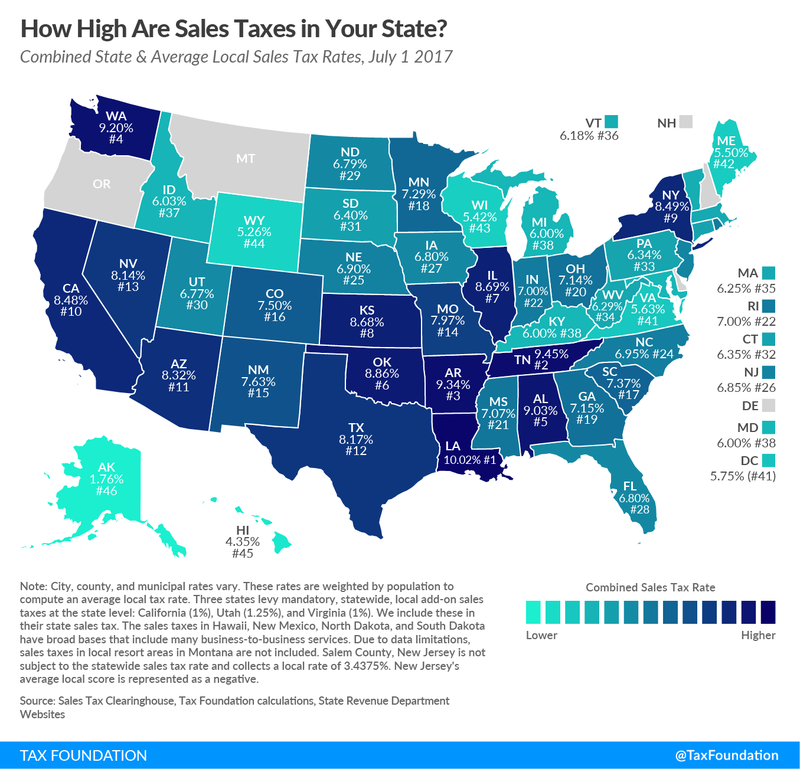 The five states with the highest average combined state and local sales tax rates are Louisiana (10.02 percent), Tennessee (9.45 percent), Arkansas (9.34 percent), Washington (9.20 percent), and Alabama (9.03 percent). Virginia's state sales tax rate is 5.3%, which ranks #31. The average local sales tax rate in Virginia is 0.33%. The maximum local sales tax rate is 0.70%. The local "rates are weighted by population to compute an average local tax rate." The combined state and local sales tax rate is 5.63% for a combined rank of #41. In addition, the Tax Foundations notes "(t)hree states levy mandatory, statewide, local add-on sales taxes at the state level: California (1%), Utah (1.25%), and Virginia (1%)," and are included in the state sales tax. Growls readers should also write to their state legislators. The following legislators represent Arlington County in the Virginia General Assembly: Senators (Adam Ebbin, Barbara Favola, or Janet Howell) and Delegates (Rip Sullivan, Patrick Hope, Alfonso Lopez, or Mark Levine). Contact information for members of the General Assembly can be found here -- use one of the "quick links" to locate the senator and delegate who represent you. For information about the Tax Foundation, click here. "We hold these truths to be self-evident, that all men are created equal, that they are endowed by their Creator with certain unalienable Rights, that among these are Life, Liberty and the pursuit of Happiness. That to secure these rights, Governments are instituted among Men, deriving their just powers from the consent of the governed, That whenever any Form of Government becomes destructive of these ends, it is the Right of the People to alter or to abolish it, and to institute new Government, laying its foundation on such principles and organizing its powers in such form, as to them shall seem most likely to effect their Safety and Happiness. Prudence, indeed, will dictate that Governments long established should not be changed for light and transient causes; and accordingly all experience hath shewn, that mankind are more disposed to suffer, while evils are sufferable, than to right themselves by abolishing the forms to which they are accustomed. But when a long train of abuses and usurpations, pursuing invariably the same Object evinces a design to reduce them under absolute Despotism, it is their right, it is their duty, to throw off such Government, and to provide new Guards for their future security. Such has been the patient sufferance of these Colonies; and such is now the necessity which constrains them to alter their former Systems of Government. The history of the present King of Great Britain is a history of repeated injuries and usurpations, all having in direct object the establishment of an absolute Tyranny over these States. To prove this, let Facts be submitted to a candid world." HT Historic Documents, The Patriot Post. "On this, our nation’s 241st Celebration of Independence, we should do more than contemplate the words of our nation’s Founders. We should rise every day prepared to support and defend them. I invite you to read our primer on the Endowed Rights of Man, and a concise Civics Lesson on the risk to that endowment. For further reading, see our Essential Liberty essays. "Join us in daily prayer for our Patriots in uniform — Soldiers, Sailors, Airmen, Marines and Coast Guardsmen — and all who stand in harm’s way in defense of Liberty. Pray also for their families." For information about The Patriot Post, click here. To see who has endorsed The Patriot Post, click here. "Most Still Link July 4 with Declaration of Independence"
"Most Americans still rate the Fourth of July high on their list of holidays, second only to Christmas, and correctly identify what it commemorates. "A new Rasmussen Reports national telephone and online survey finds that 56% of American Adults consider Independence Day one of the nation’s most important holidays, although that is down from a recent high of 61% a year ago. Just six percent (6%) view the Fourth of July as one of the least important holidays, while 36% rate it somewhere in between the two." "Most Think Americans Should be Proud of U.S. History"
"There has been much debate lately over whether states should remove monuments and other symbols that reflect a part of American history that is no longer in line with the nation’s values today. But even with a speckled past, most Americans still believe they should be proud of this country’s history. "A new Rasmussen Reports national telephone and online survey finds that 68% of American Adults think Americans should be proud of the history of the United States. That’s down just slightly from the roughly three-out-of-four who have said the same for the past nine years. "Sixteen percent (16%) think instead that Americans should be ashamed of the United States’ history, while 15% are undecided." At Power Line, Scott Johnson has two separate posts about "The Eternal Meaning of Independence Day." In the first post, Johnson writes about "Lincoln's July 10, 1858 speech, which Johnson says "is one of his many great speeches, but in one respect is uniquely great. It concludes with an explanation of the meaning of (Independence Day) to Americans with matchless eloquence and insight in words that remain as relevant now as then." Johnson includes what appears to be President Lincoln's entire speech. Johnson's second post about "The Eternal Meaning of Independence Day" involves the 150th anniversary of the Declaration of Independence on July 4, 1926 when President Calvin Coolidge provided "a magisterial review of the history and thought underlying the Declaration. His speech on the occasion deserves to be read and studied in its entirety." He includes one paragraph from President Coolidge's speech. Finally, in today's Washington Post, Gregory Schneider writes "Jefferson's powerful last public letter reminds us what Independence Day is all about." In a TaxByte article, Deducting Taxes from Taxes, last week, Tom Giovanetti, president of the Institute for Policy Innovation, writes, "Through the federal tax code, we encourage higher state taxes by allowing the deductibility of state taxes from federal income taxes." "She may be the youngest woman ever elected to Congress and an up-and-coming Republican, but Elise Stefanik is running cover for high taxes. "Stefanik, joined by six other New York Republican House members, this week urged Treasury Secretary Steve Mnuchin to drop the proposal to eliminate a federal tax deduction for state and local tax payments from the Trump administration’s tax reform plan. "One way to look at this, of course, is that it’s just Rep. Stefanik looking out for her constituents, who just happen to be in the highest tax state in the nation. Okay, fine. But should Secretary Mnuchin and Stefanik’s Republican colleagues yield to her pleadings? "Put simply, we encourage higher state taxes through the federal tax code by allowing the deductibility of state taxes from federal income taxes. The deduction of state taxes partially insulates taxpayers who otherwise might resist higher taxes or flee to a lower-tax state. "The high taxes in these states are essentially subsidized through the federal tax code by taxpayers from low tax states. "According to the Tax Foundation, California alone is responsible for 19.6 percent of the national tax cost of the state tax deduction, with New York second at 13.3 percent, New Jersey at 5.9 percent and Illinois at 5 percent. Adjusting for population, New York is #1, New Jersey is #2, Connecticut is #3, California is #4, and Maryland is #5. Hence Rep. Stefanik’s entreaties. "It’s perfectly appropriate and federalist for states to determine for themselves their appropriate level of taxation. Fine, have your high taxes if you want. But federal policy should be neutral toward state taxes, rather than subsidizing higher taxes through the federal tax code. "And it certainly doesn’t make sense for taxpayers in low-tax states like Texas and Florida to be subsidizing high-tax states like California and New York. "That’s why many tax reform plans, including those currently being discussed on Capitol Hill, rightly remove the deductibility of state income taxes. "So either removing the deduction for state taxes entirely (best), or limiting\capping the deduction (okay), is a welcome and appropriate element in Congress’ current tax reform efforts. "Ronald Reagan famously said, “If you want more of something, subsidize it; if you want less of something, tax it.” [i] And while Reagan wasn’t an economist, his logic on taxes and subsidies was simple and impeccable, and we would do well to bear his maxim in mind as we work through the details of fundamental tax reform." In the footnote, Giovanetti writes, "This quote has been attributed to Ronald Reagan as well as to his economic advisors Jack Kemp and Art Laffer, but it is most commonly associated with Reagan." Wouldn't it make a lot more sense to switch to a flat tax for the federal individual income taxes? There would be no need to worry about the politically connected gaining special tax breaks, not to mention what it would do for economic growth or raising additional revenue? For more information about the Institute for Policy Innovation (IPI), click here. Source: Top 10 Famous Political Quotes, Great-Quotes.com. "Henry Louis Mencken (born Sept. 12, 1880, Baltimore, Md., U.S.—died Jan. 29, 1956, Baltimore), controversialist, humorous journalist, and pungent critic of American life who powerfully influenced U.S. fiction through the 1920s," according to Encyclopaedia Britannica. In yesterday's Washington Times, Stephen Dinan begins, writing, "The controversial “Obamaphone” program, which pays for cellphones for the poor, is rife with fraud, according to a new government report released Thursday that found more than a third of enrollees may not even be qualified." "Known officially as the Lifeline Program, the phone giveaway became a symbol of government waste in the previous administration. Now a new report from the Government Accountability Office bears out those concerns. "The report, requested by Sen. Claire McCaskill, Missouri Democrat, also says the program has stashed some $9 billion in assets in private bank accounts rather than with the federal treasury, further increasing risks and depriving taxpayers of the full benefit of that money. "The program, run by the Federal Communications Commission, predates President Obama, but it gained attention during his administration when recipients began to associate the free phone with other benefits he doled out to the poor. "Some 10.6 million people have an Obamaphone, but 36 percent of them may not qualify, investigators said after sampling the population and finding a huge chunk of people couldn’t prove they were eligible. "More than 5,500 people were found to be enrolled for two phones, while the program was paying for nearly 6,400 phones for persons the government has listed as having died. "Investigators also submitted fraudulent applications to see what would happen, and 12 of the 19 phone carriers they applied to approved a phone. "The theory behind the program was that poor people needed a phone to apply for a job or conduct other business in the modern economy, so they were provided with what was supposed to be a low-cost, limited-service benefit." He also noted this was only the GAO's latest warming, noting, "Previous reports had warned the Obama administration the program was susceptible to double-dipping, and that the FCC didn’t even have a good yardstick to measure whether the program was meeting its goals." The Daily Caller's Luke Rosiak also reported on the findings of the GAO audit. He pointed out, "The fraud reached unheard-of proportions because the Federal Communications Commission let the task of screening for eligibility fall to phone companies that profit off of enrolling as many people as possible." “'Universal service fees' cell phone subscribers pay on their monthly bills supplies the money for the program, formally known as Lifeline, rather than funding from Congress. The Anti-deficiency Act prevents agencies from spending more than funds appropriated by Congress, so the move effectively allowed the FCC unlimited spending . . . ."
"Free cell phones for low-income Americans, one of the fastest growing welfare programs in the United States, is—by the Federal Communications Commission’s (FCC) own admission—rife with “waste, fraud and abuse.” And who is paying for these free Obamaphones? If you have a phone subscription, you are. "The program, officially called Lifeline, predates Obama’s presidency but has earned the colloquial name “Obamaphone” after nearly tripling in cost since 2008. "Almost everyone who pays a phone bill has an extra monthly charge that contributes to the Universal Service Fund, which covers Lifeline access. The government pays companies $9.25 for every person connected through Lifeline. Recipients typically receive a free wireless phone and a certain amount of airtime. "These Obamaphones aren’t iPhones, but they typically have nearly all the capabilities offered through a standard phone contract." At American Thinker, you can watch a 2013 Fox Business 4:23 minute video as "Jillian Melchior sat down with Fox Business Network's Melissa Francis to shed light on how the $2.189 billion Lifeline program, which is supposed to provide subsidized phone service to the poor, has become notorious for fraud and abuse." For your information, most of the above links include embedded links that will take you to additional source material. To read the entire 89-page General Accountability Office report, or the 1-page highlights, click here. "President Reagan started the program at a time when there were no smart phones and few cell phones. The idea was to get the big telephone companies to supply land line phones to the poor for emergency use. Since no taxpayer money was being used for the phones themselves, it seemed to be an acceptable partnership between the government and private businesses. "But like almost all government programs, this one got out of control. The explosion in wireless communications made it ridicuously easy to defraud the companies until today, nearly 2 in 5 participants in the program are not eligible. "Ultimately, the government is responsible for the administration of the program. The FCC has been lax in the past in oversight, but with a new chairman dedicated to rooting out fraudsters, that's going to change."